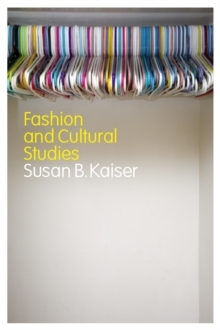 Bridging theory and practice, this accessible text provides an introduction to fashion from both cultural studies and fashion studies perspectives, and addresses the growing interaction between the two fields. Cultural studies relies on fashion to exemplify change as well as continuity, examine identity and difference, agency and structure, and production and consumption. Fashion, meanwhile, benefits from the interpretative lens of cultural studies; its key concepts, contextual flexibility, and attention to bridging 'high' and 'popular' culture, contemporary and historical perspectives, and diverse identity issues and methodologies. Organised thematically, the book uses a wide range of cross-cultural case studies to explore ethnicity, class, gender and nation through fashion, and explains the ways in which these notions interact and overlap. Drawing on intersectionality theory in feminist theory and cultural studies, Fashion and Cultural Studies is essential reading for students and scholars.